Dolphins belong to the cetacean grouping of sentient beings. 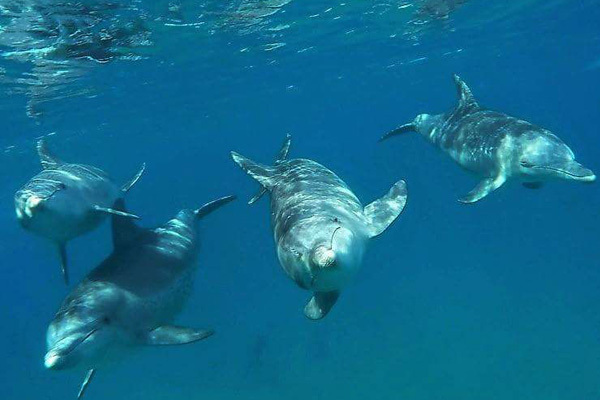 Their smiling faces, coupled with the many stories of human and wild dolphin encounters, have resulted in a special connection between us and them. 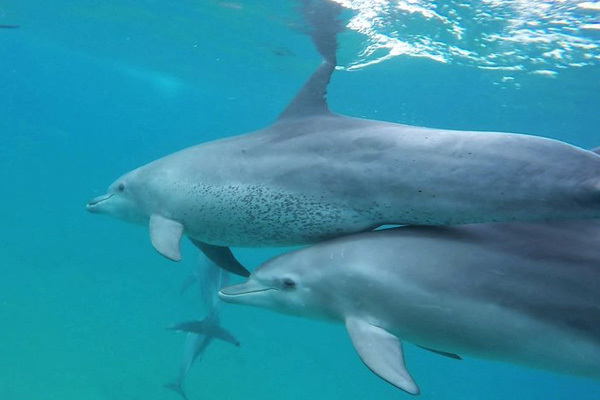 Swimming with wild dolphins has become the ultimate dream for many because of their healing and playful natures. Here in the Ponta Do Ouro Partial Marine reserve (MPA) in Southern Mozambique, nestled between Kosi Bay / Isimangaliso Wetlands Park and the Maputo elephant Reserve, you will find the idyllic beach resort of Ponta Malongane / Complexo Turistico do Malongane, where Halo Gaia founder Courtney Ward has been running respectful swimming with wild dolphin escapes for over seventeen years. Her infectious song and loving nature ensure that her visitors get to enjoy a “swimming with dolphins” experience of a life time. Here Courtney talks of observing the magic of a Humpback dolphin calf nursing from a Bottlenose dolphin mother, proving that wet nursing occurs within the dolphin species. She tells of the times that she has witnessed the playful tactics of dolphins bouncing turtles and puffer fish around as if they are mere soccer balls in a surreal game of dolphin soccer. Then there is the story of the dolphins who decided it would be fun to frolic and tease the gentle giant of the ocean, a Whale shark. These stories, amongst the many others witnessed by Courtney and her guests, go a long way in supporting the belief of the sentient nature of wild dolphins. So come and enjoy the gift of swimming with dolphins. OUR PROMISE: All dolphin interaction is respectful and conscious on the dolphins' terms and natures's conditions. 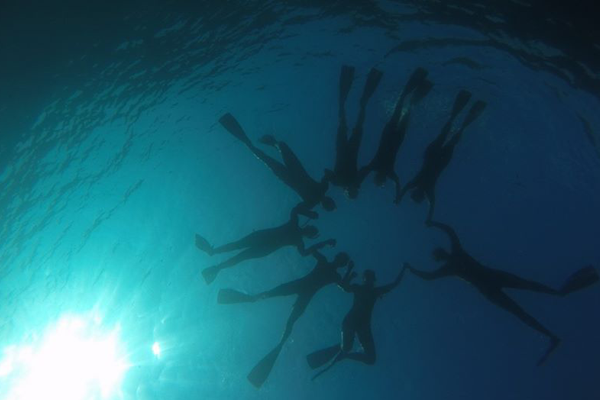 To compliment the “swimming with wild dolphins” programme, Halo Gaia hosts an extraordinary array of both local and international facilitators and wellness experts. 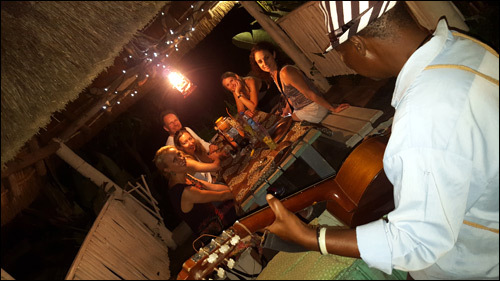 Workshops in the many arenas of wellness coupled with the deeply life changing “Wild Dolphin” encounters are a very sought after experience for the conscious traveller. Halo Gaia Adventure Travel legally operates all Dolphin Scenic Tours under the “Transporte Maritimo Commercial de Trafego local de Passageiros” license issued to Malongane for commercial dolphin launches in the PPMR : Ponta do Ouro Partial Marine Reserve of Southern Mozambique Dolphin Coast. The socialised resident dolphins that frequent these warm waters of Southern Mozambique are the more common In-Shore Indo Pacific ( Indian Ocean ) Bottlenose dolphin (Tursiops Aduncus), recognisable by its darker grey top and lighter grey belly, often distributed with spots as they age. These dolphins are relatively large measuring around twice the length of an average human. They are highly sociable dolphins, having been spotted in pod sizes of around 90 members even though. 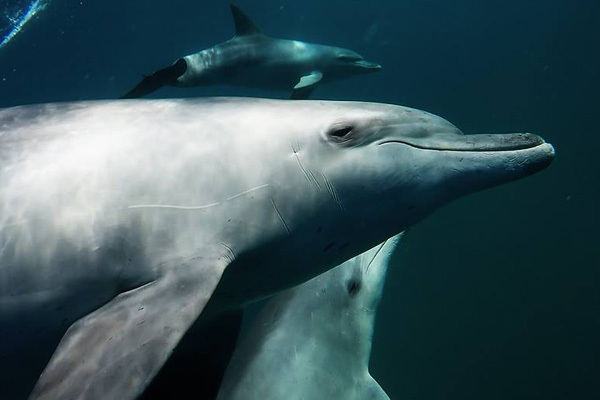 200 identified dolphin members, is what the visitor to Malongane is most likely to encounter with Halo Gaia. Another somewhat frequently observed dolphin off these shores are the un-socialised Spinner Dolphin (Stenella longirostris) living in mega pod sizes of more than a hundred dolphins. These tiny, reaching the size of an average man, acrobatic dolphins is sometimes found interacting with the boats in the form of bow-riding. They are rarely seen in the shallow waters, mostly spotted around 3 – 4kms out in water depths of around 30 metres. The Spinner dolphin has stunning markings leaving us with the impression that they have been carefully made up with a fine paint brush. Then there are the shy Indo-pacific Humpback dolphins (Sousa Chinensis) that have been observed, from time to time, socialising with the Bottlenose Dolphins in the shallow inshore waters. On these rare occurrences only one or two Humpback dolphins have been spotted in amongst the Bottlenose dolphin pod, which isn’t surprising as they sadly occupy a position on the endangered species list as near threatened. 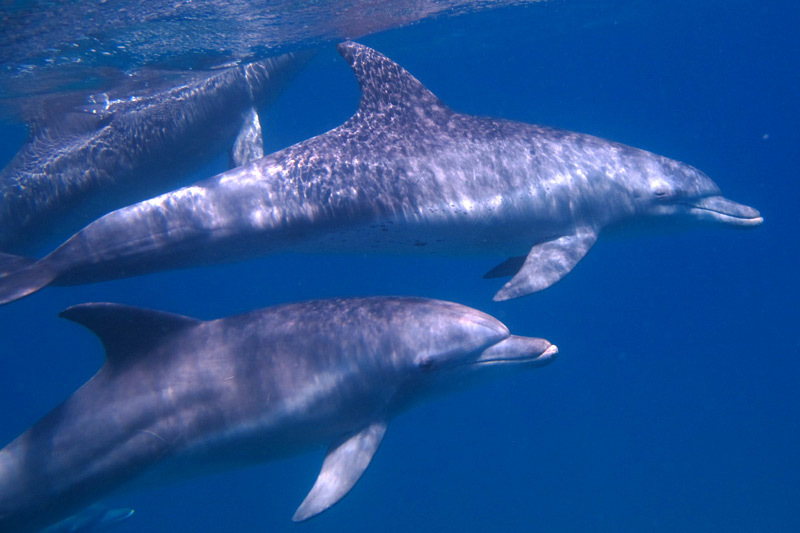 These medium size dolphins have similar colouration, if a little shorter in length, to the more common Bottlenose dolphin. What sets them apart from the bottlenose dolphin is the distinctive hump on the back of the Humpback dolphin. The Pantropical Spotted Dolphin (Stenella attenuate) has been observed in the further Northern rangers, but as yet not seen in the NPA waters. Courtney and her visitors would be overjoyed to have them venture further South. The adult dolphins are spotted all over hence living up to their name of Spotted Dolphin, often the youngsters have little spots and can be confused with their cousin bottlenose dolphin. In years gone by the spotted dolphin did experience a significant reduction in their numbers due to indiscriminate tuna hunting practices. 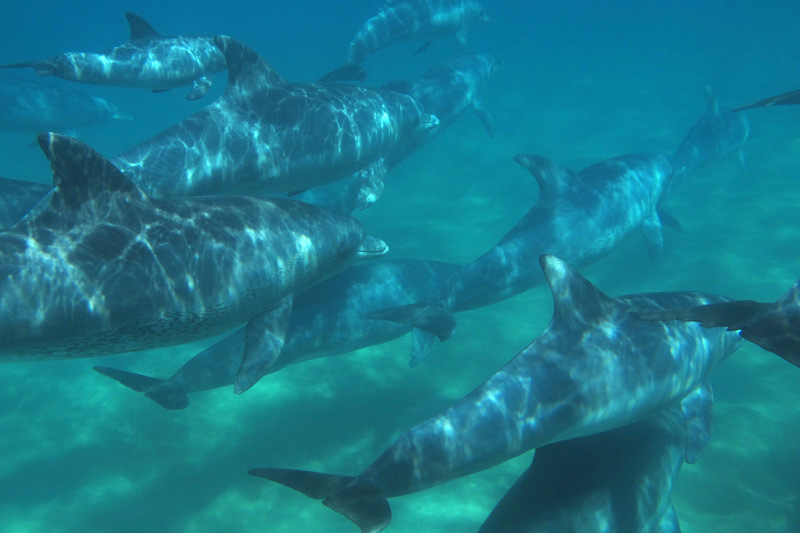 Since the 1980’s however, there has been a huge increase in their numbers, reaching almost the population size of the most common Bottlenose dolphin, this has been due to the implementation of dolphin friendly tuna capture methods. These waters have offered the swimming with wild dolphins visitor frequent sightings of the majestic Humpback whale (Megaptera novaeangliae) with its distinctive knobbly head and long pectoral fins. To the delight of Halo Gaia dolphin cliental, these whales enter into the warm Southern Mozambique waters during the winter months, July to October, to calve and provide regular respectful close up boat sightings. During these times there are also wonderful sightings of both dolphin and whale interactions frolicking together in play. Courtney may share tales of these educational sightings, whale calves gleefully breeching among the agile smaller dolphins, their joy is tangible, which makes swimming with wild dolphins and experiencing humpback whales so special. 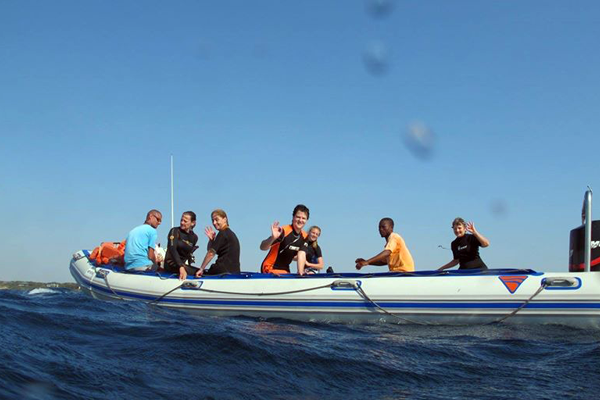 Click here to read more about the Whales of Mozambique. 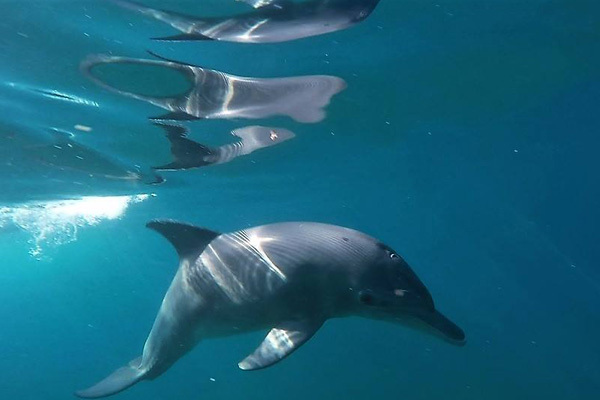 Go swimming with WILD DOLPHINS in the Ponta Do Ouro Partial Marine Reserve in Southern Mozambique. 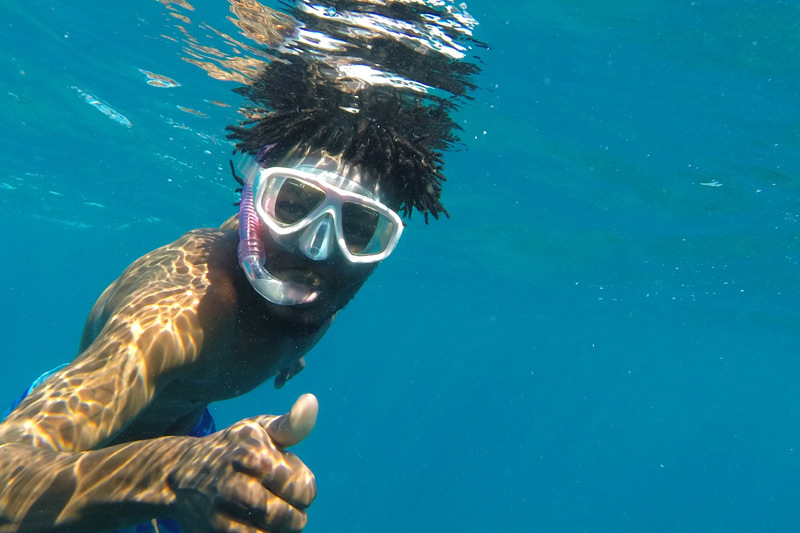 The Halo Gaia visitor gets to enjoy an authentic encounter while swimming with dolphins, as well as immersing into the vibrant world of the Latino-African Mozambican culture. 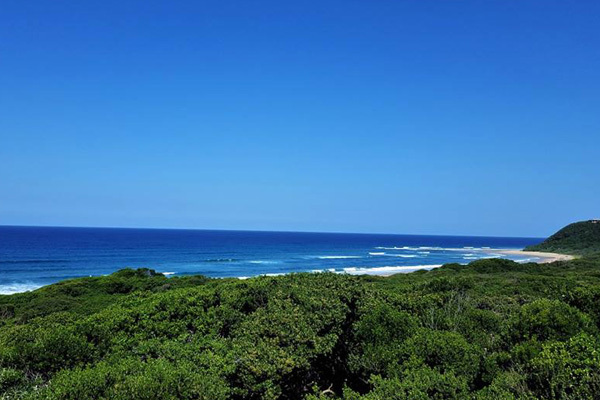 When Responsible Eco-tourism and Green Travel is encouraged, as it is here in Ponta Malongane, it offers the responsible traveller an experience closely linked to nature. Halo Gaia and Complexo Turistico do Malongane follow the strict regulations of a no touch policy with the resident Wild dolphins and all other marine species. The One Boat policy ensures the dolphins do not experience harassment of any sort. 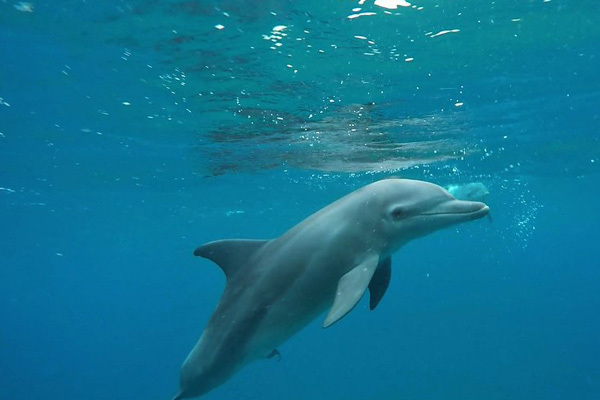 The above operators – fondly known as the Dolphin Ambassadors – also regularly meet to discuss protocol – changes to conduct and seasonal swim / in water etiquette – based on data findings – high tourist influx over certain periods of the year. Responsible Eco-tourism / Green – conscious travel additionally and importantly plays a direct role in the upliftment of a local population. Have all your vehicles original papers handy in a folder. If your car is hired, you must not forget the letter from the company giving you authority to take the vehicles across the border for the maximum period of 30 days even if you are going only for a few days. This will cover you in case of emergencies. Do the same when you fill in the forms at the border. Rather put the maximum period of 30 days for your visit / holiday. Make sure that your passports are in order. They will not allow you to enter if the passport is going to expire within 6 months of entry. The passport should also have at least 2 blank pages available for stamping. When you get your passport back from the border officials make sure that they have all been stamped. Never ever carry all your money in you wallets. Hide the majority of your money in your luggage. Check our MOZ INFO files for all the items that you require in and on your vehicles. Border procedure is also available under their file section. Keep to the speed limits and wait for the 60-up sign. It is the road sign with lines through the 60. This means that you can travel 100km again. There is also under the files the fines that can be issued so make a copy and keep it and refer to it if you get a fine for speeding. Make sure that front and back passengers all wear their seat belts. No luggage or items on back seat of your vehicles. No alcohol open or closed in the front all should be packed in the boot. MAKE COPIES OF ALL YOUR PAPERS, PASSPORTS AND DRIVERS LICENCE. IMPORTANT – Get your third party insurance at the border. Your third party insurance from SA is not valid in Mozambique. DO NOT DRIVE AT NIGHT IN MOZAMBIQUE! REMAIN FRIENDLY regardless how of upset you are after a few stops by the police. Do not remove your seat belt when you are pulled over. Only if you are getting out of your car, but wait until the policeman has seen you wearing it. Remove your sunglasses when you are talking to the police. They like to see your eyes and it is a sign of respect. Try and greet the police in Portuguese (Bom dia or Boa tarde). You can then tell them that you do not speak any Portuguese. Hand your papers over if they ask. Normally it is only your driver’s licence and Car Registration (Green Form) and the TIP (temporary import permit). If you are being stopped for speed and you do not agree with the police regarding the speed that is shown to you, refer them to your GPS if you have one that records your speed that you travel. If you were speeding take it like a man. Don’t blame the police officer for doing his job. Insist on a written fine and go and pay it at the nearest police office. The only place where you can pay a fine outside of towns is where the police have a permanent stop with an office built on the side of the road. (satellite office). If they ask for money to let you go without paying show them a purse / wallet with a maximum of 100 or 200 meticais and tell that you very sorry, that’s all you have in cash. 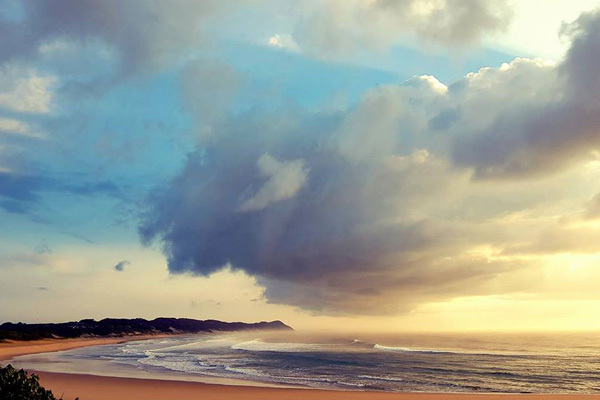 Swim will dolphins in the idyllic, wild Ponta Malongane, Mozambique and find your FREE! 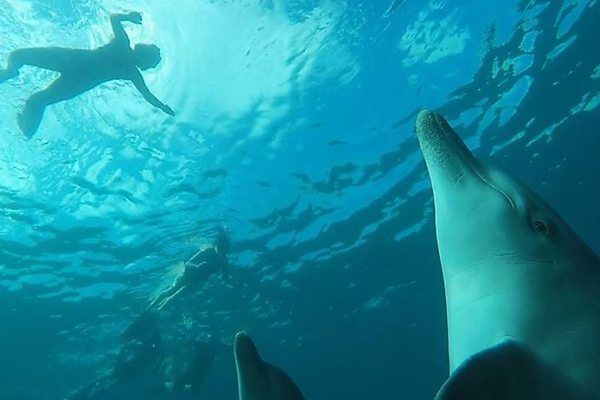 Enjoy a “swimming with wild dolphins” experience of a life time with your host, Courtney Ward and other internationally-reknowned facilitators and wellness experts. 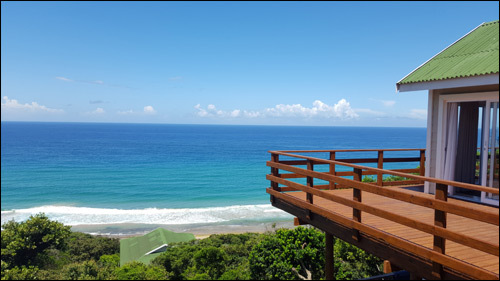 Head on over to our year-at-a-glance page for a quick view of our “swimming with wild dolphins” plans for upcoming retreats and events. Are you ready to be WILD and FREE with Halo Gaia? Have to thank Courtney Ward for an amazing swim yet again +-10 years since my last one ~ but this time able to share it with my baby girl in the boat with dad while I was in the water with my big girl after her swim earlier with dad. Blessed does not even begin to describe the experience! Every once in a while we experience something that impacts deeply and unforgettably. 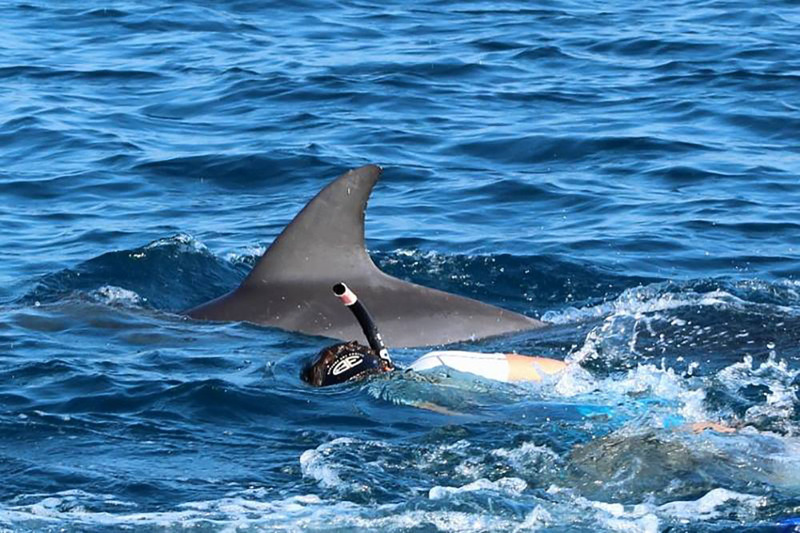 Swimming with wild dolphins in Malongane, Mozambique was, for me, one such magical event. Courtney’s approach with these mammals is respectful and non-intrusive ~ a conscious, intimate interaction. Error: Error validating access token: Session has expired on Friday, 05-Apr-19 21:57:31 PDT. The current time is Monday, 22-Apr-19 07:04:05 PDT.